Miho Sawada investigates the idea of mass communication, spoken language, and the signs and symbols of pop culture. She searches out the myth between the object and its layered meanings by playing with familiar and functional objects like walls, boxes. Installed in fall of 1987, Homosapiens is a work that is indicative of Sawada’s fascination with mass communication and its effect on human relationships. Sawada takes up aspects of human self-interest including matters of power, success and wealth, and freezes them in space and time, providing an insight on humanity’s fragmented existence. Born in Osaka Japan, Miho Sawada studied art at the Kyoto City College of Art. She came to Canada in 1968 to continue her studies at the University of Toronto. A resident of Toronto, Sawada has had numerous solo exhibitions in Japan, Canada, and the United States. Installed in 1967, Untitled Construction addresses the conditions of the inner self and the dichotomies of life. In its abstraction, the sculpture reveals the concepts of human experience by ‘denaturing’ the self-serving appropriation of popular western symbols. In addition, the structure allows for viewers to experience the feeling of being within and experiencing space in different ways. After studying at the Ontario College of Art and Design from 1957-1959, Ed Zelenak travelled to Dallas, Texas, in 1960 where he resumed his studies at Fort Worth Art Centre and Barsch Kelly Atelier. His work can be found in the collections of the National Gallery of Canada, York University, and the Art Gallery of Ontario. Inspired by the Giant’s Causeway in Northern Ireland, Tom Benner's Stone Columns evokes the legends associated with megalithic phenomena including rock formations and pre-historic structures, such as Stonehenge. It is an important example of the artist’s early sculpture constructed of synthetic materials to underscore the delicate ecological balance between the natural and constructed world. Benner graduated with an arts diploma from H.B. Beal Secondary School and has exhibited extensively over the past 40 years. His environmental concerns are often reflected in life-size installations of endangered species as he explores the changing symbiotic relationship between humans and nature. Embedded in a gently sloping mound, Ra’s Voyage harmonizes with its surroundings. The self-contained simplicity of the piece gives a sense of both age and timelessness qualities, also suggested by the reference to the Egyptian Sun God Ra. Bill Vazan’s body of work investigates the human-cosmos relationship. He ultimately considers that nature and humanity are linked, and that what is important is not what is seen, but rather what is unseen and unknown. Pit Genie invokes the concept of the natural and the metaphysical worlds within one urban environment. The paths carved into the rock provide a contrast between man-made society and the natural environment it inhabits. Vazan graduated with a B.A. from Sir Georgia Williams University (now Concordia), and now currently lives and works in Montreal. The artist is internationally known for his land art creations, sculpture, painting, and photography. 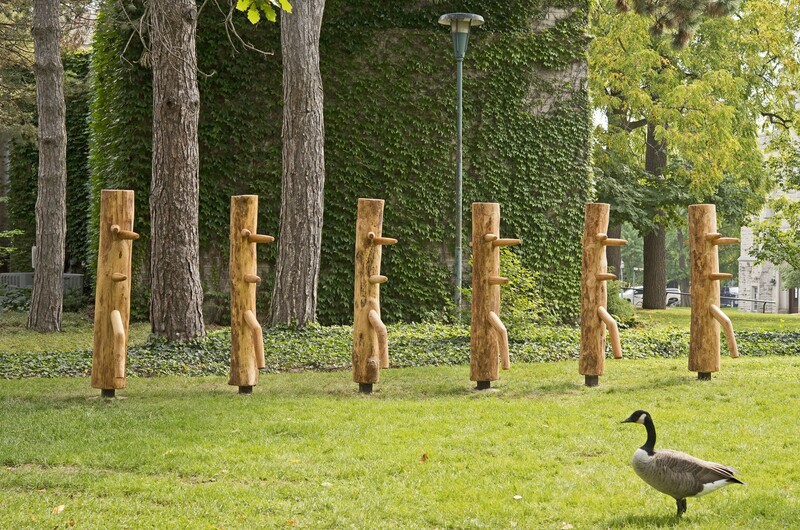 Last Stand comprises six sculptures based on the Muk Yan Jong, or “wooden man post” used for training in the Wing Chun form of Kung Fu. Each figure is made from ash trees cut down because of emerald ash borer. As an abstraction of the human body, Muk Yan Jong predate by several centuries similar modernist sculpture, which they resemble. For Ross Bell, the exhibition title Last Stand evokes several tangential associations: the decimated ash trees of southwestern Ontario, a defensive military front, and the artist’s position as a maker of things in an increasingly virtual world. Born in Alberta, Ross Bell lives in London, Ontario, where he has exhibited at DNA Artspace and Westland Gallery. He has also shown at the Art Gallery of Guelph and Chela Gallery, Baltimore. Bell is represented by Georgia Scherman Projects, in Toronto, where he has also exhibited at Propeller Centre for the Arts, and the Toronto International Art Fair. The geometric composition of Cloister Dialogue reflects the Gino Lorcini's lifelong interest in the sculptural structure. Though he often used aluminum and stainless steel for their animated reflective properties, polished bronze offered a warmer, skin-like texture. The double totemic form creates a dynamic tension in the negative space separating them, implying a conversation between two anthropomorphic figures. Lorcini emigrated to Canada in 1948. He studied with Group of Seven member Arthur Lismer at the Montreal Museum of Fine Arts, and later taught at McGill University. From 1969 to 1972, he was artist-in-residence at Western University. For centuries, the pergola has been used in formal gardens to provide partial shade and support for flowering vines. Here, the Reinhardt Reitzenstein suggests how natural systems are intrinsically linked to social structures and rituals. Living wisteria plants intertwine with cast bronze grapevines that the artist incorporated into the steel framework. 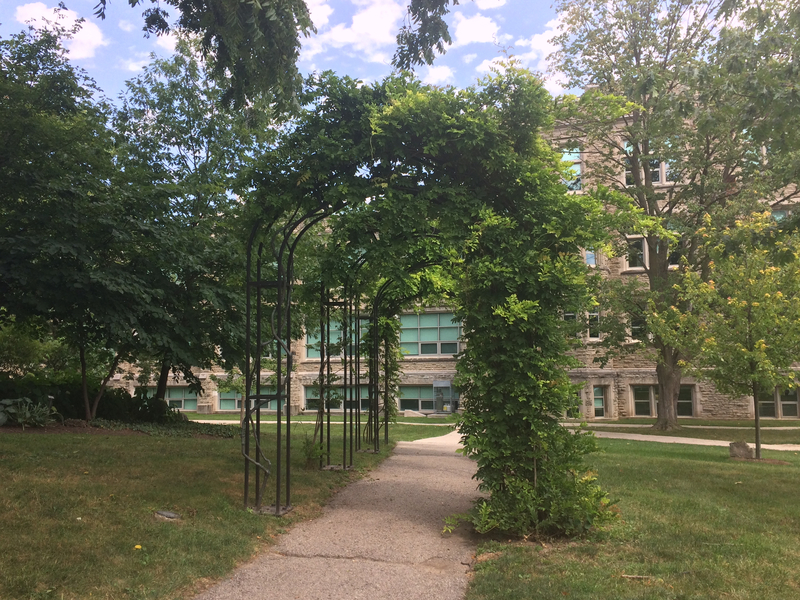 A site-specific installation, the pointed arches of Western Pergola echo the Collegiate Gothic architecture of the Physics and Astronomy Building to the east. The viewer is invited to complete the work by moving through the pergola. Wood, glass, cast, spun welded metals, bronze, steel, trees, sound, photography, digitally processed images, video, water, are all instruments of Reitzenstein's eclectic processes exploring and interconnecting nature, culture, science and technology. His social concerns and mission as an artist are based in sustainable practices. Reinhard Reitzenstein immigrated to Canada in 1959. He studied art at the Ontario College of Art in Toronto, and has taught at University of Guelph and Brock University. 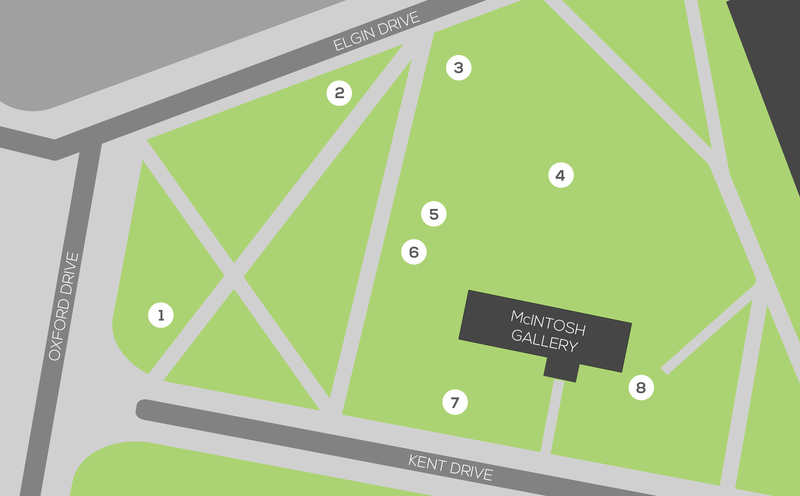 He has exhibited extensively and has completed many public sculptures, including Western Pergola, which was commissioned for McIntosh Gallery’s 50th anniversary.